Reducing pathogen populations in the thatch or rootzone, with targeted turf management practices and early fungicide applications, could slow down the onset of damaging disease outbreaks occurring and, over the course of the season, reduce overall treatments and costs, writes Dr Ruth Mann of STRI. 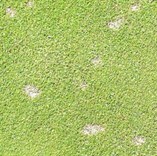 Turf disease can hit with alarming speed and cause severe damage to pristine playing surfaces - in some cases, overnight. Where have the diseases come from? And how do they come about so quickly? We tend to think of disease control once weather conditions become conducive to that particular disease. For example, warm, sunny days and cooler nights immediately make me think of Dollar Spot. The moisture from cool evenings with heavy dews, combined with warmer daytime temperatures, is perfect for Sclerotinia homoeocarpa, with Dollar Spot symptoms (below, left) tending to be observed shortly after. Unless controlled they can quickly coalesce into large patches of damaged turf surface (below, right). Similarly, those mild, wet autumnal mornings, when the soil is still warm and the air cooler, herald the beginning of Fusarium Patch season. When weather conditions are suitable for disease, outbreaks can sometimes flare up before turf managers have time to take any action, resulting in damage that may take weeks or months to repair. The problem is that the pathogens that cause turf disease may survive in the thatch or rootzone as spores or dormant mycelia, waiting for the right conditions to return. In some cases the pathogen will be growing and proliferating in the turf base or rootzone long before we see the symptoms of the disease on the surface. Using Integrated Turf Management (ITM) to create an environment at the turf base that is unfavourable to the pathogen will therefore reduce its ability to multiply so rapidly and infect the grass plants when weather conditions become favourable. This can be done in many ways, such as aeration to encourage beneficial aerobic fungi and bacteria in the rootzone that fill the spaces where pathogens would live. These beneficial organisms will also break down organic matter (which is often also the food source for the pathogen to survive on). The immediate pH around the grass plant is important too. Keeping the pH slightly acidic not only promotes the growth of the finer grasses, but can also reduce the growth of some pathogens, further reducing the potential for disease outbreaks. This is the reason for recommending acidifying fertilisers such as ammonium sulphate. Both of these cultural practices effectively reduce the amount of pathogen inoculum. Early fungicide application has also been shown to reduce the inoculum of certain diseases. 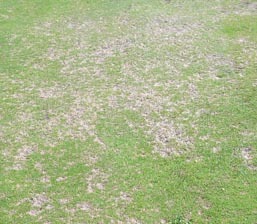 For example, work by Paul Koch of the University of Wisconsin-Madison demonstrated that using chlorothalonil and/or propiconazole in early spring reduced the inoculum of Sclerotinia homoeocarpa and prolonged the period before Dollar Spot symptoms became unacceptable on golf fairway turf. Propiconazole, as in Banner Maxx and Instrata, being a systemic fungicide, was more effective than chlorothalonil over the three-month period between application and Dollar Spot severity reaching 10% ground cover. It was concluded that this early season fungicide use could reduce the following season-long fungicide programme by up to two fungicide applications, without reducing turf quality - saving time and money. 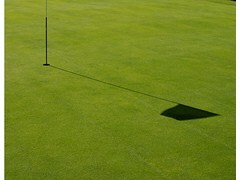 Therefore, on courses with continual history of a certain disease, applying an appropriate fungicide early in the season - when we know the pathogen is multiplying, but before we see symptoms - may allow a later start date for a conventional preventative fungicide programme without any loss of turf quality. Click here for more information on ITM plans for turf quality. Do ITM plans actually work in optimising fungicide use and delivering consistently better turf quality? Have you had any great successes, or spectacular failures? Help others by passing on your experience on the GreenCast forums. Click here to post a coment.